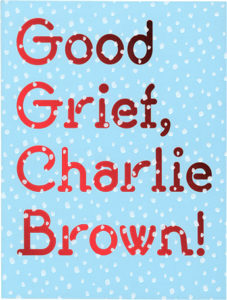 So life has been full, and even after I got around to ordering Good Grief, Charlie Brown: Celebrating Snoopy and the Enduring Power of Peanuts, and even after it arrived slowly from England, I let it sit around for over a month before finally getting around to giving it a good look. Now I regret all those delays, because there are a couple of people who would have liked this book, which was the printed accompaniment to a Peanuts show at the London arts center Somerset House, which ran from October 25th, 2018 to March 3rd of this year. Unfortunately, as the show is now over, this book appears to be no longer available. 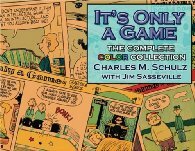 The first half of this book is a reasonable Peanuts-celebrating coffee table book, with a foreword by Jeannie Schulz followed by pieces on the place of Peanuts in culture, how it reflects the world and how it influences it. 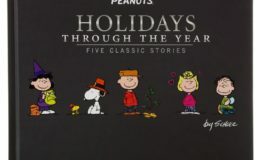 Most of this accompany images of Peanuts strips shot from the original art… and unlike that almost-full-size book of original art, these are pages that show the passage of time. They’re signed by Schulz to someone, the paste-up items have shown age. That gives the piece some additional life. 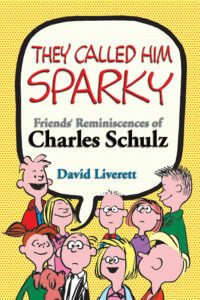 Then there are pieces like the reproduction of some of the correspondence between Harriet Glickman and Schulz that inspired the creation of Franklin. I’ve seen that material before, of course (I included some of it in one of my books), but there was some new stuff even for me, like some good images of Peanuts characters being used on uniforms and patches from the war in Vietnam, or the letters from Timothy Leary before his days as the high guru of LSD. However, the book got forgiveness from me by saying that Woodstock first appeared in March of 1966, when he hatched on Snoopy’s stomach. It goes along with my view of things, rather than the sources that claim that Woodstock didn’t appear until the following year. The back half of the book chronicles the other aspect of the art show, which is work by a number of current artists reflecting on, reacting to, influenced by, or incorporating Peanuts. Some of this seems to have been done for the show, some of it is pre-existing. The effect is mixed, I have to admit. Some of these pieces, I see something nice to them, but some of them leave me blank. If a work is not beautiful, nor impressive in its skill, nor communicates something, nor inspires thoughts within me, then I don’t see the point. And in any instance, that may be me, the same work may have a very different effect on others. But hey, I like the works that collide Peanuts imagery with outside dialogue, whether it be Mark Drew’s series laying rap lyrics into Peanuts panels or Lauren LoPrete’s well-established “That Charming Charlie”, where she drops lyrics from The Smiths songs into panels (although dadgummit, I wish the had used the difference between the seriffed I and the non-seriffed I in comic book lettering before doing some of these.) And the still photo of Matthew Plummer-Fernandez’s Echo Youth cannot do it justice, but the augmented reality app which places protest placards in front of any scene sounds intriguing. All in all, I like this book. It was a mite pricy (and moreso now; the only copy that I find on the used market is on ebay for about triple what the original one cost), but I’m glad that I have it. 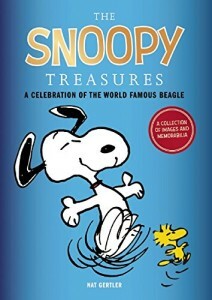 As a side note: while they are no longer offering this book, Somerset House does still have some of the Peanuts necklaces they were offering at a discount price.